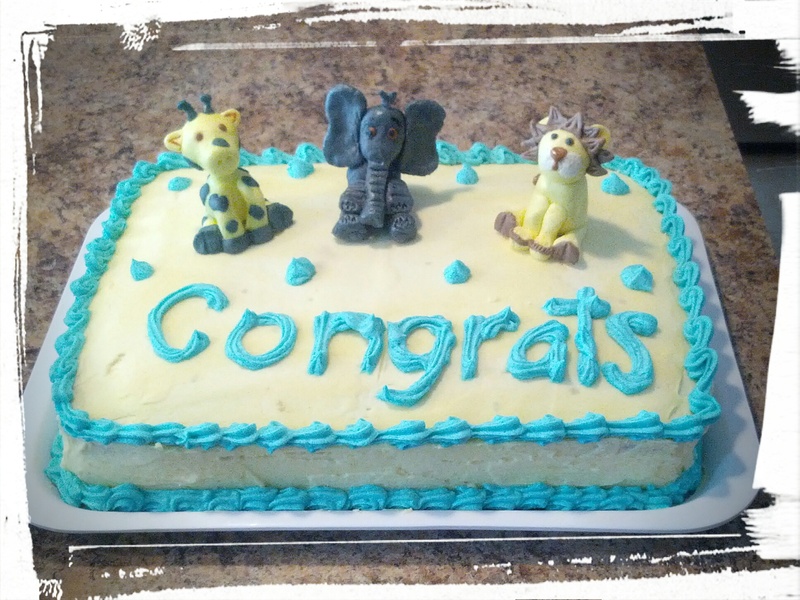 Memories of Meals Past: Let Them Eat (Baby Shower Themed) Cake! I’m at that age where the invitations one gets for life-stage events tends to be mostly for baby showers. Which is fine by me, because I love babies! And yes, I say that recognizing that I don’t have a baby and therefore am speaking from a non-sleep-deprived viewpoint. But I think babies are always A Good Thing! And speaking of Good Things, I made a baby shower cake for a friend last weekend, hence this Memories of Meals Past post, using the inimitable Martha’s recipe for a basic vanilla cake. I baked the first layer and prepared the animal themed fondant cake toppers, and then realized that I needed to bake a second layer for the cake. So I was still up and baking at 1 am the night before the shower. Needless to say, I was tired the next day. But also satisfied, because I rather liked my cake. Was kind of cute, I thought! I made some homemade marshmallow fondant using this recipe from Wilton, but frankly, I’ll try another recipe next time. I found the fondant wasn’t as pliable as I’d like (I like to sub in some cornstarch for some of the icing sugar — I find it easier to mold), even though it was super-fun to play with. It’s basically grown-up playdough, that you eat; what’s not to love? And how did I make the animals? I just googled pictures of animal themed fondant cake toppers and went from there. It’s easier than you think, so I urge you to try it. I made the fondant on a Thursday, baked the cake on a Friday, and made the cake toppers in the wee hours of Saturday morning. I froze the cakes overnight on Friday (err, Saturday really), and the next morning, whipped up some homemade buttercream frosting (using coconut oil instead of shortening in it, which gave it a fabulously coco-nutty flavour). As I told my mom, it looks homemade, but homemade with love! And I think that’s really the best kind of cake that there is. Wouldn’t you agree? This entry was posted in Blatherings, Cakes, Memories of Meals Past on September 3, 2015 by Margaret. Crunchy bits of buttery delight! 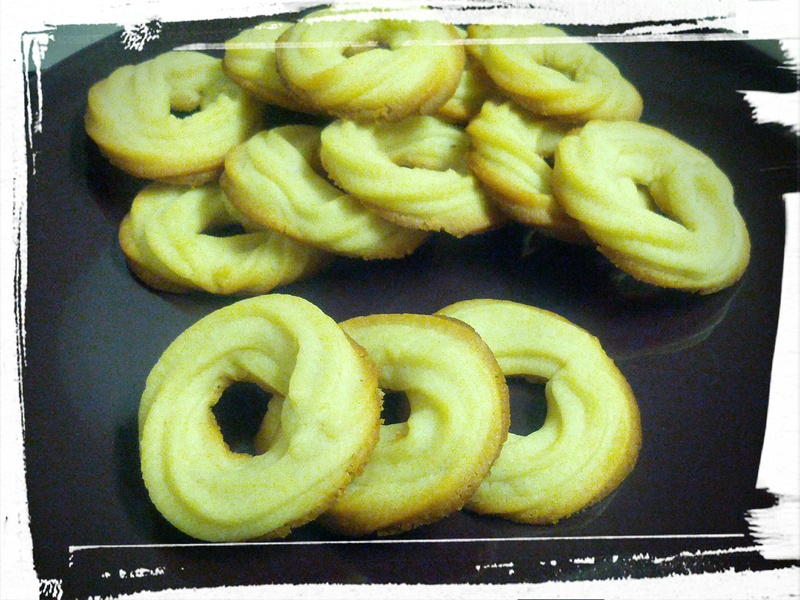 I love those Danish butter cookies that come in those blue tins. I’m sure you know the ones I mean! I could happily crunch through a dozen of those with a glass of milk. 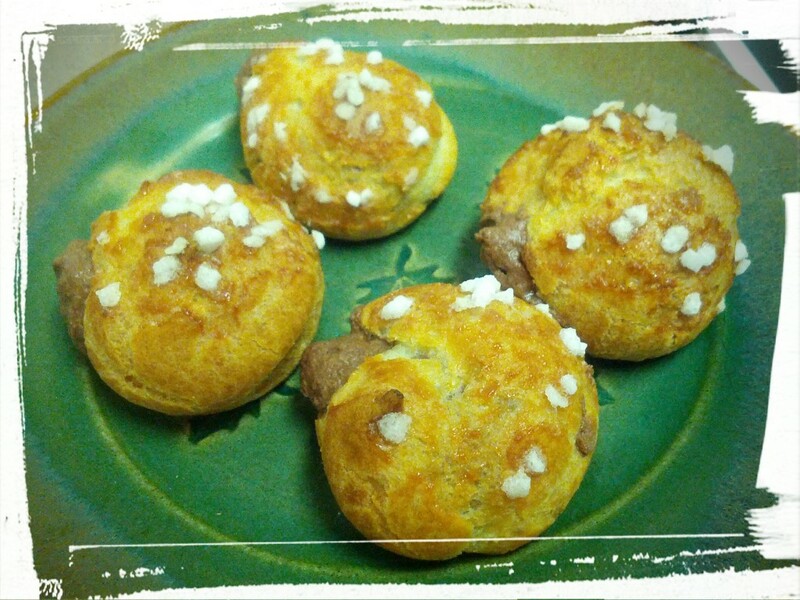 So when I found this recipe, I was very happy! This is the fastest recipe for cookie dough that I have ever come across — you literally dump everything in a mixer, mix it for a minute, and you’re done. 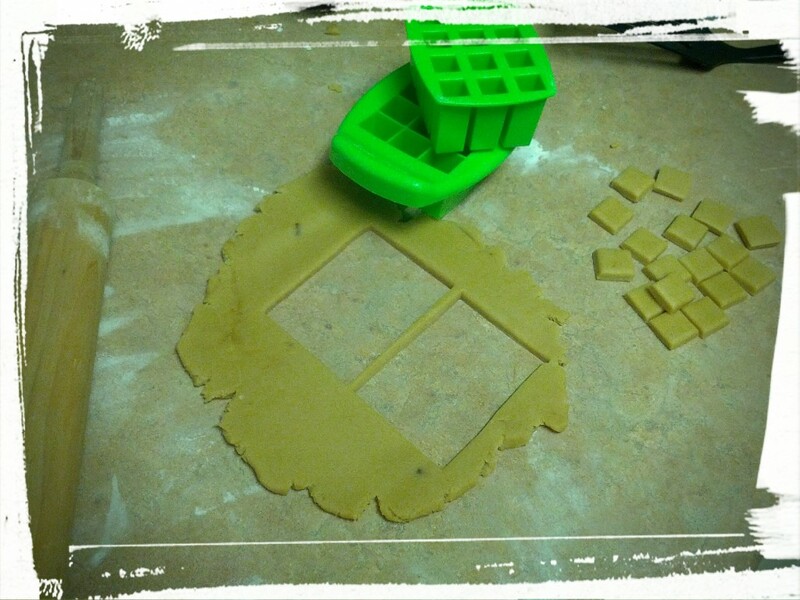 I considered using a cookie press, but ended up just using a piping bag with a star tip. It took some squeezing to get the dough out of the piping bag, but once I got the hang of it, it came out just fine. I did have to pipe a double layer of dough in order to get the shape I wanted, as they do sort of melt and spread in the oven, but once I did that, it was great. The flavour is nice, but not QUITE as buttery as I’d like it to taste. That said, there’s an entire cup of butter in it, and any more and the cookies wouldn’t hold their shape. My rating? Four whisks up! Because it’s easy to mix, and pipe (would be super-easy in a cookie press), and bake. And it has a nice delicate crunch! You could easily top these with coarse sugar to really get that butter cookie look, but I like them as it. Next Post: Something with vegetables, for realz. My fridge is full of vegetables and my Pinterest sleuthing has inspired me! This entry was posted in Blatherings, Cookies, Memories of Meals Past on August 28, 2015 by Margaret. One of my friends once asked me why I didn’t turn my love of baking into a career. My answer was that while I love to do it for relaxation now, if I did it to make money, it would be stressful. (Also likely lowly paid, but that’s another issue.) I like to learn new things and new techniques, and if I was running a business I would probably be making the same things quite often. Case in point, fondant! I made fondant once, perhaps 5-10 years ago, and having learned how to do it and having done it successfully, I had no impetus to do it again. But lately I’ve been seeing a lot about decorating with fondant and especially about icing cookies with fondant, and then I had some marshmallows left over from a camping trip (and we all know my waste not, want not philosophy), so it was a perfect time to make some marshmallow fondant! At 8 pm on the day I returned from a camping trip. Baking urges; I get them. Basically play dough made out of sugar. Kid fun goes grown-up! I made a batch of the marshmallow fondant, and then I made fondant roses! I’m happy with them, although they’re not perfect. I had run out of icing sugar while making the fondant, but being the queen of substitutions, I made my own icing sugar by grinding granulated sugar in my spice grinder. Apparently I didn’t grind it finely enough, so it wasn’t as easy to work with as I had expected. Still, roses! Then I stuck the leftover fondant in the fridge for a few days. 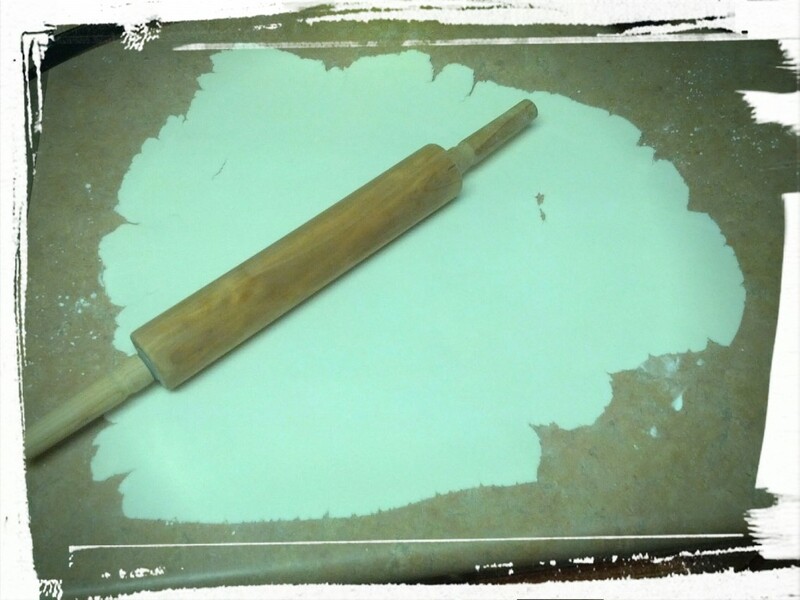 How to: brush the back of the fondant with water and press on top of cooled cookie. But leftover fondant? I had to do something with that! So I made fondant covered cookies for the DH to take to work. So much fun! 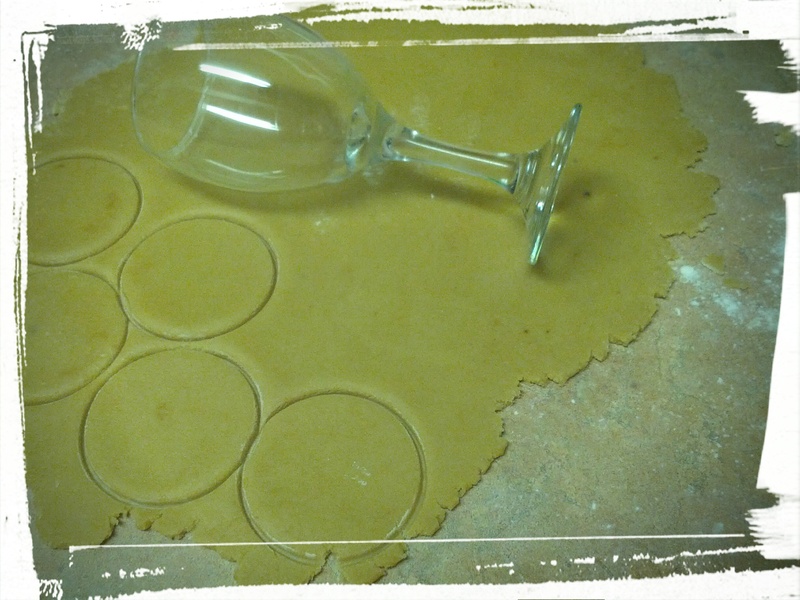 I used this recipe, and then rolled out the fondant on a cornstarch covered surface and cut out circles. 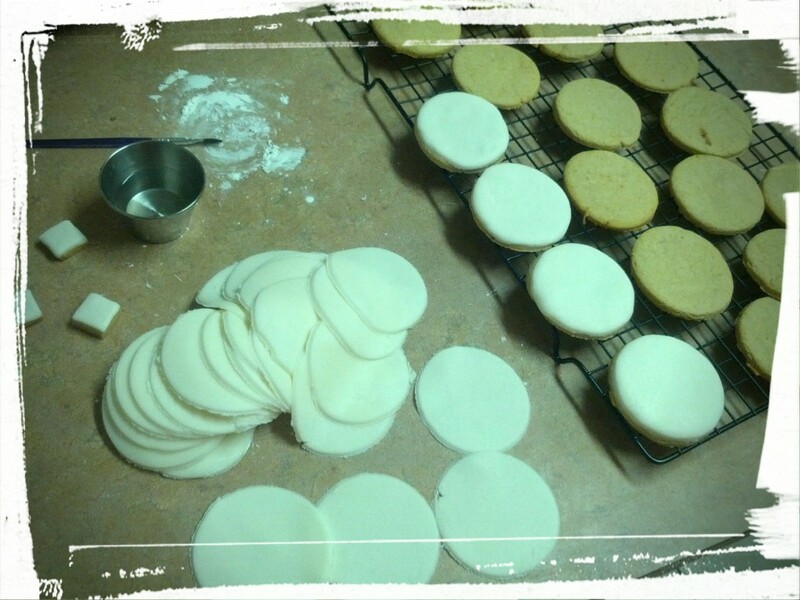 I wet the circles of fondant on the back, and then stuck them on the cookies to dry. Once they were dry, I sanded the edges using a zester, to get that professional look. And honestly, it makes a BIG difference! 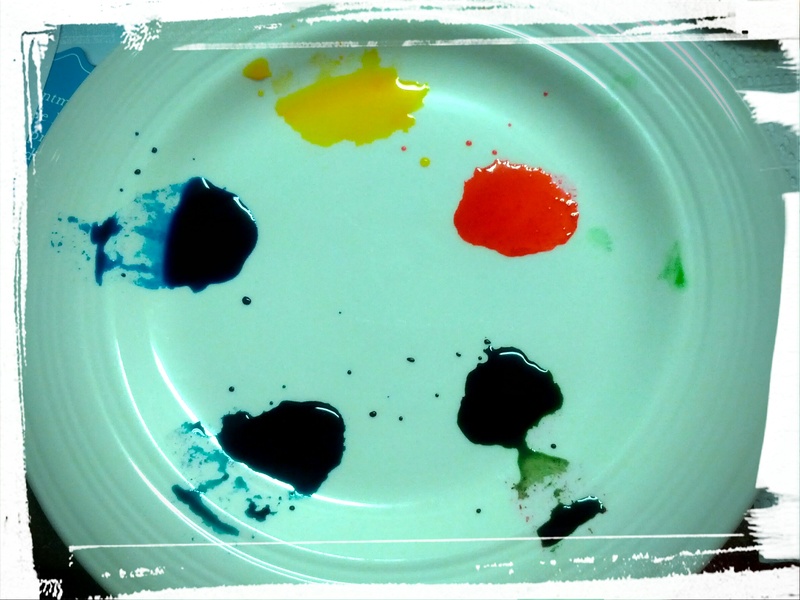 Painting with water-down gel food colouring. Obviously I had to decorate the cookies somehow. So…more learning of new techniques and experimentation! 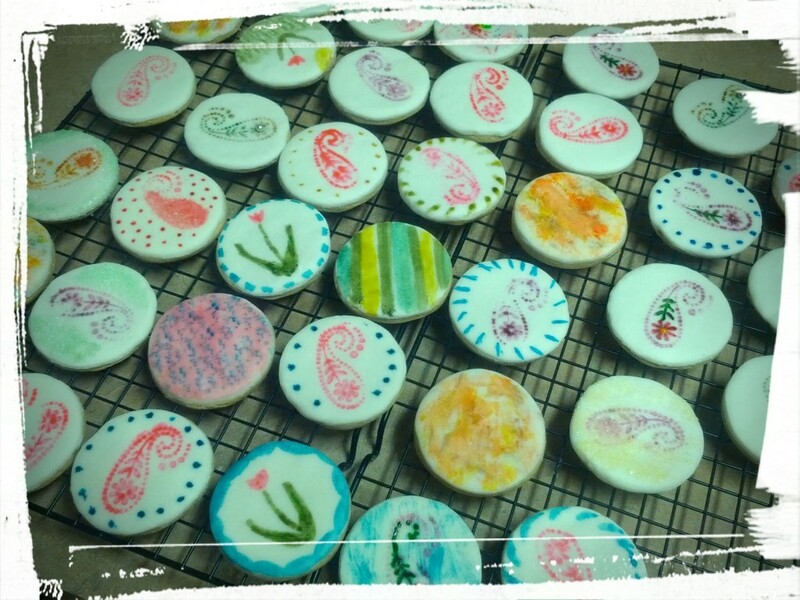 I tried stamping the fondant covered cookies using watered down gel food colouring and a stamp. I tried painting them with a brush. I tried dipping them in homemade coloured sanding sugar. I stuck silver dragees on them. At 1 am in the morning, I finally decided enough was enough and I should probably get some sleep. Designs limited only by your imagination! Or your artistic ability. I let them dry overnight and left them out for the DH to bring to work the next day. Apparently they were a hit. Yay! I love when people appreciate my baking! Enough with the ramblings and the pictures, though, let’s get to a recipe! Here’s a quickie one for when you run out of coloured sanding sugar at, say, 1 am. 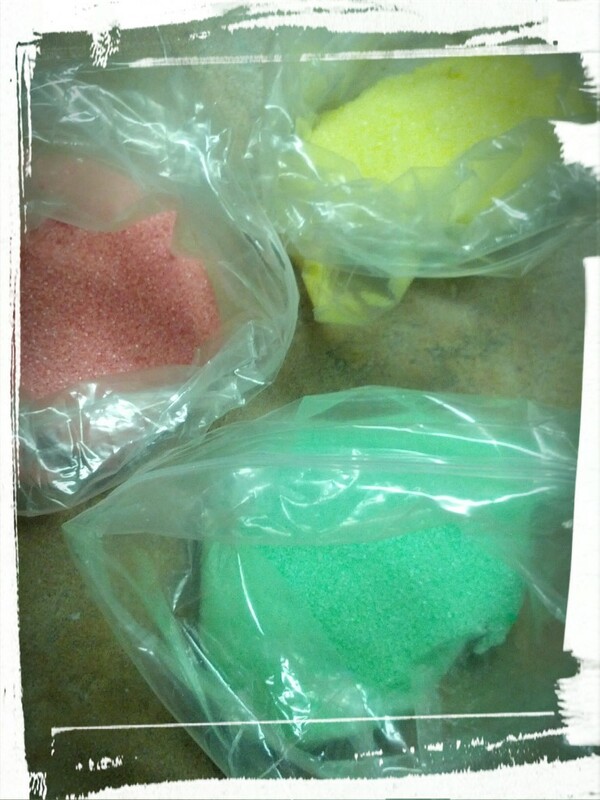 Put the sugar in a plastic baggie and add a few drops of food colouring. Zip the baggie closed and squish the sugar around until the colour is uniform. Open baggie and let dry. You can use it right away, but it’s better when it’s had a chance to dry overnight. And voila — customized sanding sugar! Particularly good for getting pastel colours of sugar. I actually made this sanding sugar a year ago for a cookie bouquet that I had made for my mother, so obviously it keeps well! Mmm…sugar. So many delicious things to do with it! 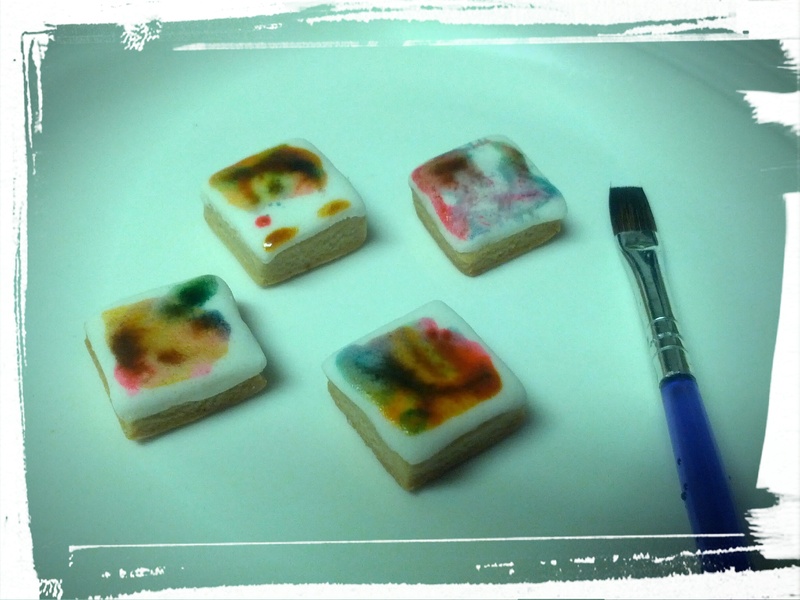 Next Post: Baking at Midnight, Part Deux — Tie-Dye Cookies and Fun Bites. 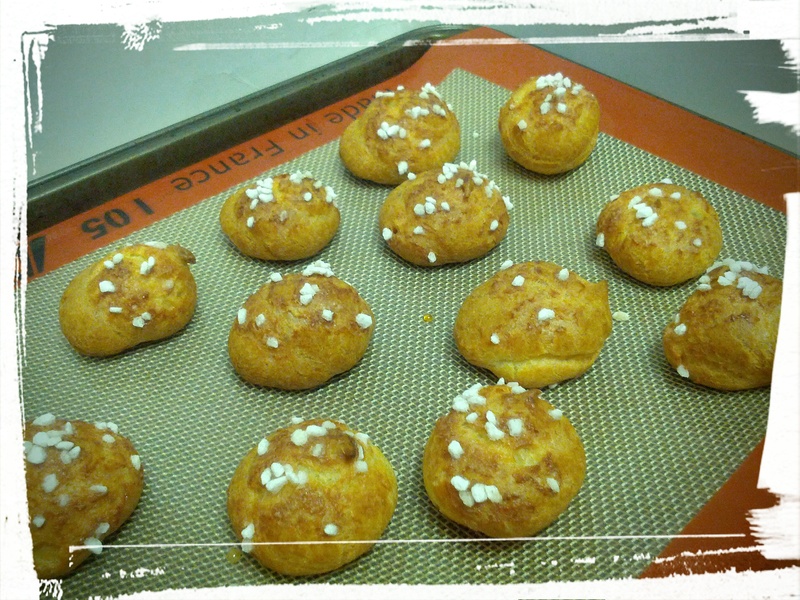 Or my updated version of old-school Schoolhouse Rolls! Both are yum. This entry was posted in Blatherings, Cookies, Desserts Not Otherwise Categorized on July 7, 2015 by Margaret. I’m a staunch vegetarian, but occasionally I will cook with meat for the DH. Now that’s love! Today is #tbt Thursday, and for once I am not writing this in the evening, as I’m at home with a nasty sore-throat-turned-cold-turned-G.I.upset. Aside from that bit of TMI, I do have a lovely recipe recommendation for my memories of meals past feature! The DH and I are still relative newlyweds (married just over a year, swoon!) and we’re still very much in the honeymoon phase (which I hope never ends. Does it? Please tell me it doesn’t!). I do sweet things like make his favourite meals, including m.e.a.t. which I cannot bear to handle raw (I’ll tell you the story some time about the chicken soup I could not finish making), and he does sweet things like surprise me when I am sick. What did he do this time? Oh, he’s so cute! I was lying sick in bed and he came home after shopping for groceries after a verrrry long day at work (he works long hours, my cutie-pie does), and saw how sick I was. I had texted him to ask him to pick up some tomato soup while shopping, but he couldn’t find the brand I had asked for so he hadn’t bought any. When he came home and saw how miserable I was (*cough*hack*moan*), he turned straight around and went out into the cold Canadian night to go to a different store to find the soup I wanted. I was so touched! He came back and made me my favourite soup and then surprised me with a carton of high-end ice cream (brownie AND cookie dough ice cream. Does he know the way to a baker’s heart or what?). It was just what I needed! And then half an hour later he popped back into the room where I was lying feeling wretched, with a package of Dutch cookies (stroop wafels), my favourite, just to make me smile. And then half an hour later he popped back into the room where I was lying feeling miserable but well-fed (hey, it’s ‘feed a cold’, right?) with a bouquet of flowers for me. I was so touched, I may have swooned upon my sickbed. Isn’t he just the sweetest? And the next day, when I was bonding with my bathroom over my illness (oh cold porcelain, how you do soothe the raging nausea! ), he was in the kitchen doing the dishes. Which may not seem particularly sweet, but as I’ve mentioned before, neither of us like doing the dishes. It’s little things like that that melt my heart, you know? Anyway, I’ll stop cooing over the DH long enough to share today’s Memory of Meals Past, which is Greek-Style Pulled Pork with Tzatziki Sauce over Greens. I still have some ham in my freezer from that epic ham I wrote about previously, so last week I pulled some of it out and marinated slices of it in a souvlaki sauce for 48 hours. Then I roasted it in the oven at 450 degrees until it was all crispy brown at the edges and bubbling away in the garlicky sauce. 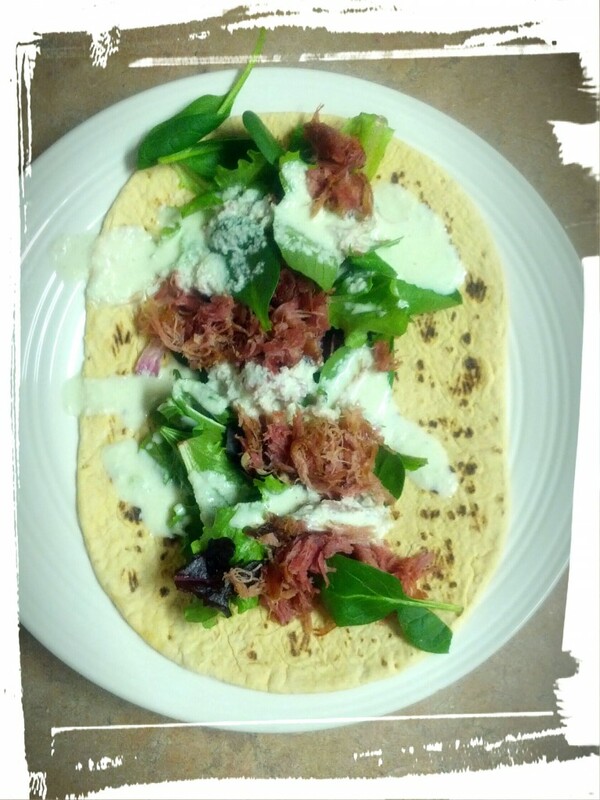 I shredded it in a bowl using two forks, and served it on a flatbread over some mesclun mix baby greens. I mixed up a tzatziki sauce using this recipe and while I was expected a dip, it turned out to be more of a sauce. So I poured it over the whole dish, and served it to the DH. He rolled it up like a burrito and ate the whole thing with gusto. Then asked for more. So I recommend you try it out yourselves! I know that ham is not really the cut of meat one usually uses for pulled pork, but whatevs, I’m the Queen of Substitutions. And I’ve used the tzatziki sauce as a salad dressing, and while you’ll want to eat some parsley after to freshen your breath, it really is delicious as a salad dressing! Next Post: Probably Vegetarian Shepherd’s Pie. Although right now I’m still sick so all I really want to eat is crackers with ginger tea. Mmm…bland crackers, the blander, the better. Sometimes that just hits the spot! This entry was posted in Blatherings, Memories of Meals Past on February 19, 2015 by Margaret.